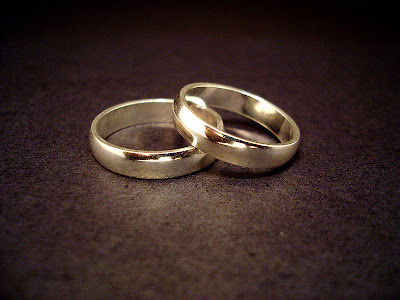 I decided that it was time to write a new wedding sermon. The old one had been in circulation for a few years now. I also decided that it was time to write a new one because the first wedding of the year is of the oldest daughter of a member of the choir, and she has heard the old one many times now! I want to leave you with a few thoughts based on the readings that we have just heard before you come to make your vows to each other. The theme of both of that reading was love. We are gathered here today because you love one another. Love can be elusive and hard to find and each one of us, if we are honest spends our entire lives looking for people to love and be loved by, in our friendships as well as in our families, and each one of us is gathered here this afternoon to celebrate that you have found love in each other. St. Paul who wrote that reading, records love’s eternal characteristics - he tells us that it is patient, kind, not envious, not boastful, not arrogant, not rude, it does not insist on it’s own way, it’s not resentful and it does not celebrate all that is wrong in the world. That’s a fairly demanding list, and your love for each other needs to be expressed in those sorts of ways. Try not to worry when life gets hard and loving is difficult, because St. Paul also tells us that true love bears, believes, hopes and endures everything that life throws at us. You are committing yourselves to each other today for the rest of your lives through good times and through bad; through joy and tragedy each one of us here hopes and prays that you will always remember the love that unites you today, and allow that to carry you through life together. N I wonder how you express your love for N? N I wonder how you express your love for N? Perhaps you can't always easily verbalize it, but you can express it most powerfully in a touch or a kiss. When true love comes it often does so with a power that we cannot control, it leads us to do things that we never thought that we were capable of. Paul writes of love with a purpose. True love gives us each and inner strength and an inner drive. True love has lead the two of you from your families to each other and eventually here today as you make your vows in the presence of your friends and family and in the sight of Almighty God. I think is particularly apt as the love that unites the two of you is the highest of all human emotions as it is through loving and being in love, we emulate God himself - as I read at the beginning of the service “God is love, and those who live in love live in God, and God lives in them. Love perfectly describes what God is like, and in sending of Jesus into the world - through his living, dying and rising again - God demonstrates to each of us the depths of his love. God’s love is something that is available to us all every day, not just the 2 of you on this your wedding day. God loves us like a parent loves their child, no matter who we are, where we are, or what we do. You are a gift of love from God to each other. So N take care of that special gift of love that you have in N. N take care of that special gift of love that you have in N and that way with the help and support of your friends and family, over the years, your love will change, deepen and grow. As it does we all pray that the both of you, and all those who know you will experience the profound depths of your love for each other in it’s source, in God. Amen. - Lego uses the ordinary to make the extraordinary. Whilst individual Lego pieces seem quite ordinary, small and insignificant by themselves they actually have incredible potential to create amazing things which are only limited by ones imagination. The same is true for N and N who are in the process of building an amazing relationship which is exciting for us as friends and family to watch grow. - Lego's strength is its diversity. Its pieces are all different shapes, colors and sizes. When these diverse pieces come together they actually create some dynamic things. The same is true for N and N who are two unique people. You have different personalities, you have had different upbringings, experiences, struggles, achievements etc. Today as you continue the process of 'becoming one' you do not cease to be two - you don't ignore your individuality, but rather your differences are to be celebrated and looked at as strengths. The challenge is for you to give each other space for your individuality to blossom and to encourage each other to reach your potential. - Lego is designed to connect. Today N and N take a further step in becoming one - they commit to this connection for life. This doesn't just happen with Lego - for it to come together it takes some intentionality and work. The reading that we heard from Colossians 3:12-17 which talks about putting on (like clothes) kindness, compassion, forgiveness etc. None of these things accidently happen. Just like N and N, you took time/energy/money to choose your clothes for today and to get dressed in your finest, it takes time and energy to grow your love. It takes a third party to put Lego together - someone who sees the big picture and who knows how the pieces fit together best. Today N and N, you are surrounded by a community who can play a part in your growth and relationship. The encouragement is for us all to help foster growth in our your marriage. Not to dominate it or tell you how to do it, but to encourage and support you. More than that we have a God who made you individually and who sees the bigger picture for you individually and together. This God desires to be a part of your formation and shaping from this day forward, for better for worse... His big picture isn't to limit you, but to help you enter into your potential in love and in life. And the love we celebrate in you is a gift from God.